I am quite superstitious, so my eyes widened in horror as I saw the date of Friday 13th January 2017 stated on chapter 1. If I thought that was bad, I ain't seen nothing yet! What a corker of a book to introduce me to Louise Candlish. Nothing good can happen on Friday 13th, and this proves to be the case for Fiona Lawson as she returns home to see a new family moving in to her house. A house she hasn't even sold, but it would appear that her husband, Bram, has... As the story unfolds via Fi's podcasts and Bram's word documents, we have a front row seat as Bram not only destroys his marriage but Fiona's whole life. I actually gasped out loud as he unwittingly dealt his final blow and, covering my mouth in horror, I mentally exclaimed: 'well played, Louise Candlish, well played indeed'. It's always good to read a story from both sides and Our House feels like watching a car crash in slow motion: with Bram and Fi hurtling towards each other at high speed and not knowing who, if anyone, will survive. 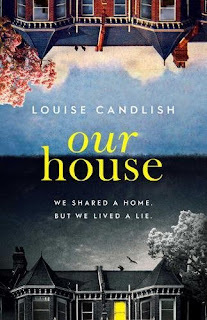 The brilliant Our House puts Louise Candlish firmly on my radar and I'll be checking out her back catalogue at the first opportunity. Our House is a most definite 5 stars from me and a highly recommended read. You might think you know how it's going to end, but I can guarantee that you'll be wrong. I loved the unusual format of the podcast transcripts and the word documents that made it feel authentic and true to life, although I wouldn't wish Fi or Bram's life on my worst enemy. Make sure you pick up a copy of Our House; it's riveting, so very addictive and jaw-droppingly brilliant.